Lithium-One Project's Silver-Leaf-Pegmatite, image by Azincourt Energy. 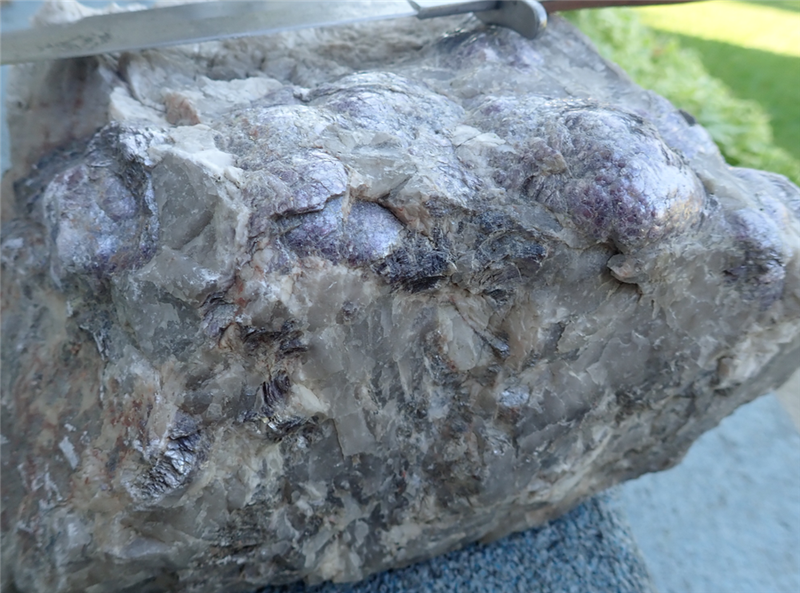 The joint venture of Vancouver-based Azincourt Energy and New Age Metals has received assays up to 4.1% lithium oxide from the Silverleaf pegmatite samples at their Lithium One project 125 km northeast of Winnipeg. The results follow a comprehensive ground mapping and sampling field program this summer. High grades were also found in nine samples that exceeded 2% and five samples that exceeded 3% lithium oxide. A second sample over 4% was also collected. A sample of spodumene blade was also sent for analysis. It assayed 8.76% lithium oxide. Azincourt said that spodumene crystals from Silverleaf contained from 3.74% to 8.04% lithium dioxide. Several other samples from Silverleaf contained high grades of rubidium oxide, which might be recovered as a by-product of lithium production. Rubidium is commonly used in speciality glass for sectors such as fibre optic telecommunications, night vision devices, photoelectric cells, and photomultiplier tubes.